The Page 69 Test: "Ghost in the Tamarind"
How the drops of water had glistened along the curve of Ponni’s neck. And Ponni’s eyes. Yes, her eyes. Ramu felt mortified when he remembered how they had flashed with amusement at him. Indignantly, he turned over, throwing himself onto his other side. The sheet slid away, uncovering his head. Immediately the mosquitoes returned. The dog that had stopped barking started up again. He was certain it was Insect. It sounded very much like Insect. What a name for a dog! You might as well name a cow Peacock, or a man Stone. Why would anyone deliberately misname something? If he ever saw Ponni again, he would demand that she explain herself. He had said he could go wherever he wanted and no one could stop him. That had been greeted with amusement both by Chellappa and Ponni. What was so funny about that? He would ask Ponni when—not if!—he saw her again. Chellappa is Ponni’s uncle. A radical firebrand, he is one of the many characters (not all of them benevolent) who undertake the education of Ponni and Ramu in the ways of a caste-ridden world—a world monstrously exacting about who can go where and why. With this world, that I set out to detail in as psychologically and historically realistic a manner as I know how, Ramu and Ponni come into terrible conflict in the decades that follow. I approached The Page 69 Test with some trepidation. 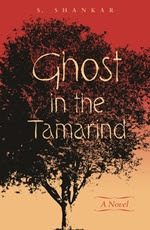 My ideal for Ghost in the Tamarind was to create one seamless tapestry of character, events, descriptions—a text in which the whole is reflected in the part. I cannot say how close the novel gets to this ideal, but my hope is page 69 illustrates that it does at least to some extent.